Posted: Saturday, August 20, 2016. 9:15 am CST. Make no mistake about it, the government is not responsible for our success in life. Ultimately, a man’s wealth is his own to make. Or as Emerson so eloquently put it, “no kernel of nourishing corn can come to him but through his toil bestowed on that plot of ground which is given to him to till”. 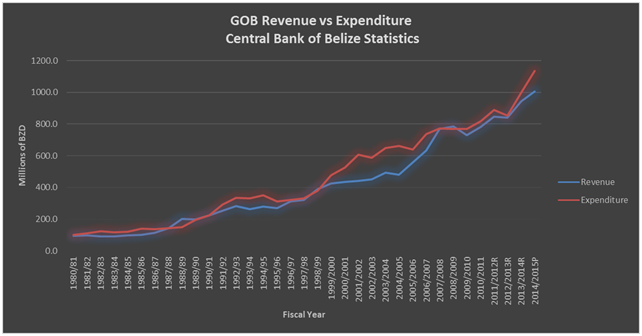 So why then has the Government of Belize(GOB)collected an increasingly higher sum of revenue over the last two decades, and more importantly, what do they spend it on? While it is true that GOB does not control us or the amount of money we can earn in our lifetime, they do have some control over the economic and social environment in which we may put our talents and skills to some productive use and profit. They can make policies and laws which ensure the fair and competitive trade of goods and services between producers and consumers, the protection of property and person from malicious harm, and the provision of other public goods. In short, they give us the “plot of ground” to till. This is why we finance them through the taxes we pay on our income, our property, our purchases etc. With government spending having grown exponentially since Independence, many times outstripping revenue, we must ask ourselves, are we getting good value for our money? A critical point to make is the difference between current expenditure which comprises spending on goods and services immediately consumed and capital expenditure which comprises spending on assets that have a longer useful life. Current expenditure includes things like salaries for public servants, travel and training expenses, utilities and the like whereas capital expenditure includes things like buildings, furniture, and technology hardware for example. Curiously, since Independence, the GOB has spent majorly on current expenses and progressively less on capital expenses. In the language of home economics, that’s like spending 70% of your income earned over a decade only on food, utility and other consumption bills and putting the balance into building your fence and occasionally upgrading your appliances. Now this is okay if your home is satisfactory and there’s no need for expansion – you have enough rooms, it’s hurricane-secure and you have brand appliances that last a lifetime. 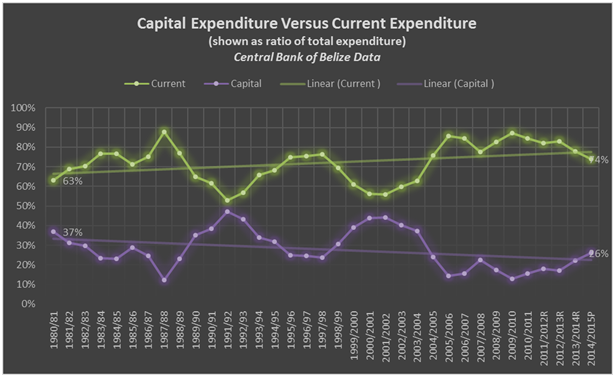 But any cursory survey of our government buildings, their IT infrastructure, our roads and other physical assets will quickly tell you that more capital expenditure cannot be a bad thing for Belize. Something as basic as good roads reduce transport costs and improve connectedness between districts which facilitate trade and promote business. If not physical infrastructure and tangible assets, then what consumes so much of government revenue? Referencing data from approved budget estimates, it is appears that salaries and wages have accounted for about 40%, on average, of all current expenses within the last decade. 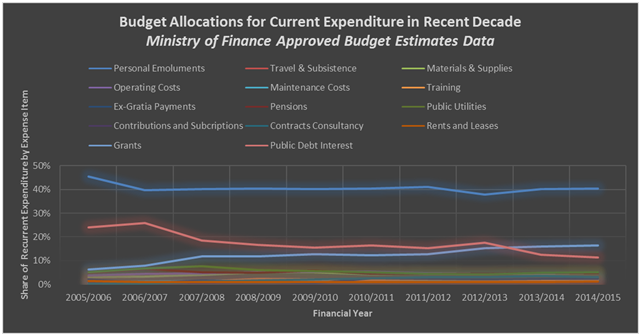 Also, while there has been some changes in the budgets available to different Ministries, the share of expenses seem to remain relatively constant. This begs the question as to the level of effort being put into having a budget that is reflective of, and responsive to, the evolving development challenges we face as a society. Very simply put, over time, we should see evidence in budget estimates that money is being put to productive use where it is most needed. Rather, what we are seeing now, is an expensive public sector flushed with cash that is going mostly to pay staff bills. But that too, would be okay if there is a solid return on the investment, as anyone with a good business sense will tell how important quality human resources are to the success of an enterprise. It is hard to say definitively if our public service professionals are delivering on their goals and objectives. Many who have the trying task of interacting with public officers will tell you no, that their attitude is many times less than helpful and service deliveryis poor. But a bad attitude and lackluster customer service from an underpaid and overworked government official isn’t enough to say our government is failing at its job. However, there are performance metrics that can inform an objective assessment. 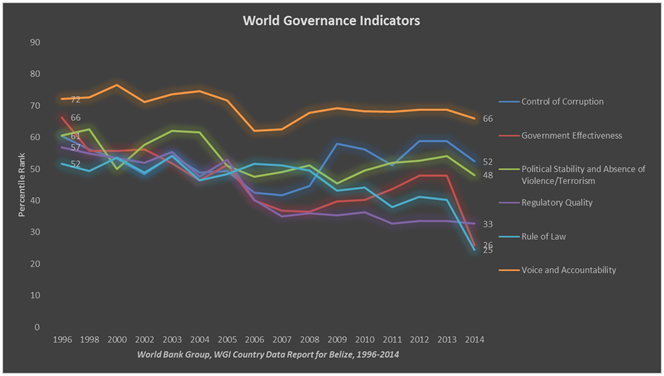 The World Bank collects data from several independent sources and presents 6 comprehensive indicators of good governance that can help tell us whether our government is getting the basics right. With a clear reduction in each aspect of these fundamental areas, it is not unsafe to say that the integrity of our democracy, and by extension our economic infrastructure, is in decline. We are less well-off now than we were two decades ago in terms of having an environment that is conducive to legitimate wealth-building. Less than optimal government expenditure is similarly evident in the private sector data. New business entry density, defined as the number of newly registered companies per 1,000 working-age people (those ages 15–64), has declined in recent years. 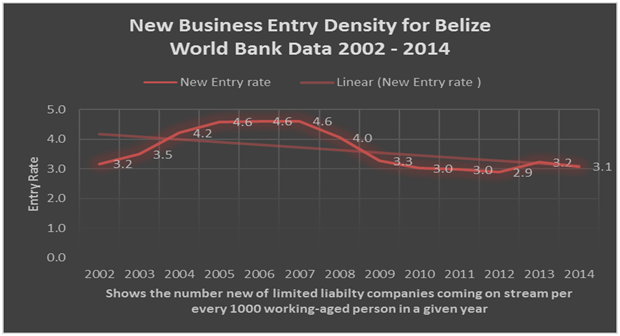 Likewise, in the 2015 World Bank’s Doing Business Report which assesses the regulatory environment for the development of small and medium-sized companies, Belize ranked 120th of 189 countries, falling well behind low-income economies like Rwanda and lower middle income countries like Vietnam. In its own class, upper-middle income economies, Belize ranked 38th of 49 countries – well behind its comparators when it comes to having a conducive business environment. At the onset, it was established that a poor government does not necessarily equate to a poor people. Our wealth is our own to make. But the government has an irreducible role to play when it comes to building and maintaining the physical and socio-economic infrastructure in which we can generate that wealth. As youths working in the this nation, driving the labour force, we must ask ourselves whether the government is giving us a fair chance to succeed by spending our money in a way that makes it easier for us to be productive, to compete fairly, or whether their using our resources in a way that constrains growth? Never forget, the government is at our employ, our taxes fun them, our citizenship authorizes them to borrow on our behalf, and their work is important to the success of our personal enterprise. As responsible citizens, we ought to pay attention to government spending: when money talks, we ought to listen.